New products and heavy spending were supposed to drive growth. They didn't. Shares of Fitbit (NYSE:FIT) tumbled 75% in 2016, according to data provided by S&P Global Market Intelligence. Investors weren't thrilled about heavy spending on R&D knocking down profitability, especially when that spending failed to produce anything other than weak guidance for the fourth quarter. In an effort to keep up its impressive growth rate, Fitbit began to dramatically increase its spending in 2016. For the first three quarters of the year, total operating expenses more than doubled, with R&D spending soaring by nearly 150%. This spending helped the company launch a number of new products throughout the year, including the Alta, Blaze, Charge 2, and Flex 2. The downside of this spending was a steep decline in earnings. EPS tumbled more than 60% during the first three quarters of 2016, with revenue not growing fast enough to counteract the massive increase in spending. With a new slate of products, the holiday season was the ultimate test of Fitbit's strategy. Unfortunately for investors, the company's guidance was a disappointment. We continue to grow and are profitable, however not at the pace previously expected. We are focused on improving the utility of our products and integrating more deeply into the healthcare ecosystem and believe we can leverage our brand and community to unlock new avenues and adjacencies of growth. Investors took that statement as a sign that the days of rapid growth are likely over for Fitbit. Whether Fitbit is able to hit its guidance for the fourth quarter remains an open question. Reports of high levels of channel inventories for the Charge 2 and Flex 2 suggest that the devices aren't selling as well as the company expected. Fitbit's ability to get its current customers to upgrade will determine whether the company beats or falls short of expectations. 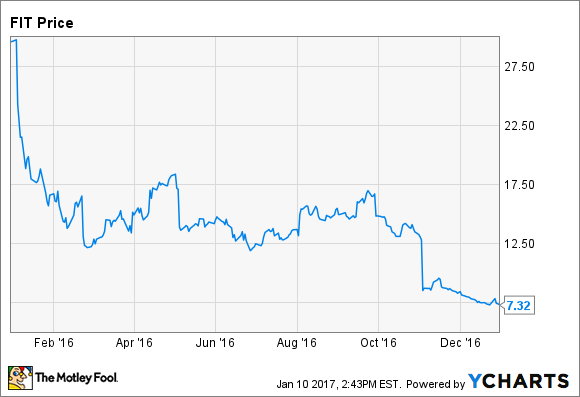 With Fitbit facing the possibility of slumping sales in 2017, the stock could continue to decline going forward. On the other hand, if Fitbit managed a better holiday season than expected, the beaten-down stock could soar. There's a lot of uncertainty surrounding the company right now, and we won't know more until Fitbit reports its results.